The luxury housing market has seen a slowdown this spring compared with last spring. Silicon Valley was the only Bay Area region with more luxury home sales this spring than last. Compared with April and May of 2015, luxury homes are generally taking longer to sell in San Francisco and Silicon Valley. However, more homes are selling above asking price in San Francisco, while fewer in Silicon Valley are fetching premiums. The relatively more affordable East Bay continues to see strong trends in the luxury market. The North Bay’s luxury market experienced a notable slowdown. Supply conditions suggest that further softening is possible, but this is more likely in North Bay than in the East Bay. San Francisco and Silicon Valley should remain solid. After 24 months of heated trends, the luxury markets appear to be normalizing. It’s the peak spring buying season, and a lot has happened with the Bay Area’s economy and housing market. 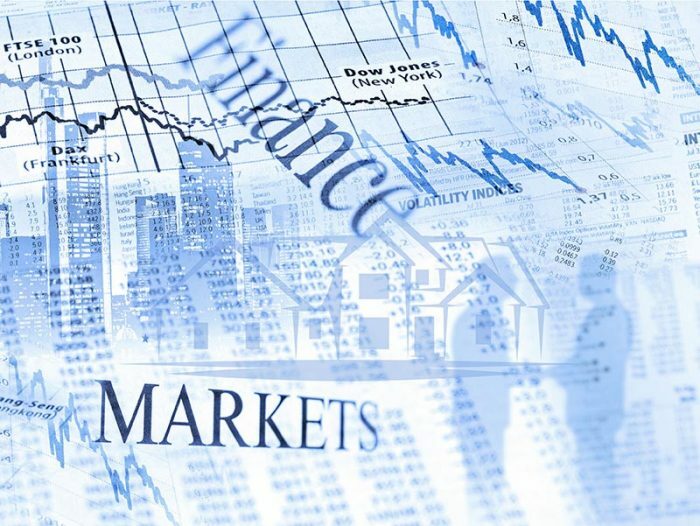 A couple of months ago, we noted a possibility of slower activity in the luxury housing market if stock-market volatility persisted and venture-capital activity remained subdued. Although our local economy is still on strong footing and adding proportionally more jobs than any other part of the country, the Bay Area’s housing markets have seen some cooling and normalization. Normalization is also evident among luxury home sales. For the purposes of this analysis, luxury homes are defined as those priced at $3 million or higher in San Francisco, Marin County, and Silicon Valley, the latter of which encompasses San Mateo and Santa Clara counties. In the East Bay — Alameda and Contra Costa counties — and Sonoma and Napa counties, luxury homes are defined as those priced at $1.5 million or higher. The analysis below offers an in-depth look at housing market dynamics between April and May of this year and April and May of 2015. Generally, sales of luxury homes comprise about 3 percent of all transactions in the region, but in Silicon Valley, Marin County, and San Francisco, that share is closer to 10 percent. Silicon Valley was the only local region with more luxury sales this spring than last, and it is also the region where the decline in luxury home sales was most anticipated given the market volatility and venture-capital slowdown. The share of luxury homes sales increased from last spring by 2 percentage points in Silicon Valley, and sales of luxury homes in total were 7 percent higher than last spring. This is of course partially driven by marked home price appreciation over the last year. Figure 1 summarizes the changes in sales activity for luxury homes across local regions. Two markets that suggest some concern in the luxury segment are San Francisco and Marin County, where sales fell by about 24 percent. On the other hand, while the East Bay had a relatively smaller decrease in luxury sales, Napa County offset most of Sonoma County’s decline. Taken together, the Bay Area has seen some decline in sales of luxury homes, but not consistently across the region and not in closely watched Silicon Valley. Figure 1: Number of luxury homes sold in April-May 2015 vs. April-May 2016. Source: Terradatum , June 1, 2016. While there were generally fewer luxury sales, there is also some evidence that the $3-million-plus luxury market is taking a breather. Today, it takes longer to sell a luxury home than it did a year ago, at least in Silicon Valley and San Francisco, which dominate the Bay Area’s luxury market (see Figure 2). Marin County had an interesting anomaly in 2015, where a few very high-end homes took a notable length of time to sell. However, even with those transactions excluded, 2015 was relatively slower in terms of the number of days it took to sell a luxury home in Marin. For example, 12 homes took longer than 200 days to sell in 2015 while none took that longer than 112 days in 2016. Similarly, the luxury markets in the East Bay and Napa and Sonoma counties saw luxury homes selling much faster this spring. The East Bay in particular benefited from relatively more affordable stock and general movement of buyer activity toward the region. Figure 2: Days on market before sale. Source: Terradatum, June 1, 2016. While time on market was more consistent across price points, all regions in the North Bay — including Sonoma, Napa, and Marin counties — generally saw more price reductions from the original sales price to final selling price. On average, North Bay price reductions ranged from 2 percent in Marin to 6 percent in Napa. San Francisco, the East Bay, and Silicon Valley continued seeing final sales price closing higher than the original listing price. In San Francisco, more homes sold at a premium this spring than last. Silicon Valley, in fact, saw a notable drop in homes selling at a premium, from 60 percent of sales last spring to 47 percent now. But the premium paid on homes selling over asking price is smaller than it was last spring, falling from 12 percent to 10 percent. In San Francisco, the 14 percent premium paid last spring dropped to 11 percent this spring. Figure 3: Share of sales selling above or below asking price. Source: Terradatum, June 1, 2016. Moving forward, supply indicators suggest we may continue to see some softness in the luxury market. Figure 4 shows the months’ supply of luxury inventory for May of this year, 2015, and 2014. Except in Napa, which has the fewest luxury sales in the Bay Area and where inventory tends to be higher, most other regions have seen a surge in supply. In San Francisco, the months’ supply jumped twofold from about two months to almost five months. Marin and Silicon Valley also saw higher supply when compared with last May. Similar conditions are evident in Sonoma County and the East Bay, where the months’ supply this year is higher than in the previous two years. In the East Bay, Alameda County had the lowest levels luxury home supply. Figure 4: Months’ supply of luxury homes. Source: Terradatum, June 1, 2016. Lastly, Figure 5 illustrates the absorption of luxury listings that were under contract at the end of May. In relatively more affordable regions, the absorption rate is highest in the East Bay — an average of 42 percent. On the higher spectrum of luxury homes, San Francisco had the largest absorption rate at 36 percent. 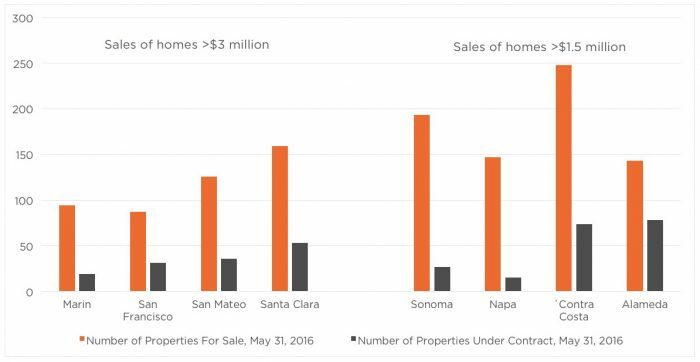 Again it appears that Sonoma, Napa, and Marin counties are generally experiencing slower absorption of luxury homes than more urban regions like San Francisco and the East Bay. Silicon Valley absorbed listings at about a 30 percent rate. Figure 5: Absorption of current listings. Source: Terradatum, June 1, 2016. All in all, current supply trends highlight the unique segmentations of the respective markets. In San Francisco and neighboring communities with accessibility to jobs and urban amenities, demand for luxury homes remains solid. Even in Silicon Valley, where rampant fears of a slowdown caused some buyers to pause, luxury housing market activity shows vitality and a continuation of last year’s strong sales. Sonoma and Napa counties are seeing higher buyer awareness and diminished frenzy from last spring as they are primarily second-homebuyer and retiree markets. Marin County has also seen a cooling in demand and more cautious buyers. All the trends highlighted above are in fact consistent with the previously anticipated normalization of Bay Area housing markets, which have been surprisingly heated for almost two years now. Still, we are only in the middle of the 2016 homebuying season, and conditions may change depending on the strength of the job market and domestic and international economic conditions. We will closely monitor the Bay Area’s luxury housing markets and provide an update in 90 days. Previous PostPrevious Real Estate Roundup: Bay Area Home-Flipping Rate in Line With U.S.